Chamonix # 025 est un condominium de 1 chambre / 1 salle de bain situé à Mammoth Lakes. Cette location de vacances dispose d'un excellent emplacement pour un accès facile aux activités toute l'année. Les clients apprécieront la proximité de la montagne et du centre-ville. Chamonix est à distance de marche du Canyon Lodge et de la télécabine du village. Restaurants, boutiques, sentiers de randonnée et pistes cyclables et terrains de golf sont tous rapidement accessibles en voiture. Le salon présente une magnifique cheminée, idéale pour se réchauffer après une journée de ski et de snowboard. Les sièges sont disposés autour d'une télévision. Le canapé sert également de canapé-lit queen-size pour 2 personnes. Un lecteur DVD, un magnétoscope, un lecteur CD et un téléphone (appels locaux uniquement) sont fournis pour votre commodité. Sortez sur le balcon privé et profitez des vues environnantes. La cuisine a tous les appareils dont un chef a besoin pour créer des repas alléchants. Deux invités peuvent entretenir la conversation avec le chef en prenant place au bar à petit-déjeuner intégré. Rassemblez-vous autour de la table à manger formelle, pouvant accueillir 6 personnes, pour savourer un dîner fait maison. La chambre est meublée avec un lit king-size confortable et une salle de bains attenante. La salle de bain a un combo douche / baignoire et une coiffeuse séparée. Chamonix a plusieurs commodités à vérifier pendant vos vacances. Il y a 1 espace de stationnement non attribué, un club house avec table de billard, foyer, sauna et bain à remous. La piscine & amp; Station de barbecue sont ouverts pendant l'été. Stay away from this place. It is not as described and the owner clearly doesn’t care. I sent the message below in an email to the owner and haven’t received a response after 11 days. If you do dare go, make sure you bring a mattress for the pull-out unless you enjoy laying directly on springs, as well as some extra sheets and blankets (no sheets were provided for the pull-out and the blankets are at least 40 years old). The management company did a relatively good job, but there was something sticky on the kitchen floor and getting extra towels was like pulling teeth. I just wanted to send you a direct message regarding our stay in your unit in Mammoth. Unfortunately, this has not been a good experience for me and my family. Aside from the location, there is very little in your description of the property that is accurate. The carpet is not new (it is worn with a tear in the entry), the furnishings are not new (the sofa bed, mattress, TV, entertainment center and more are all at least 20 years old), and while there are spas, a sauna, laundry facilities and a recreation room, we had no access to these areas because Grand Mammoth Resorts could not provide a key. You list Internet as an amenity, however, there were no directions anywhere on how this Internet was accessible from your unit. I had to contact the management company myself and learned that the only Internet available was from a unit two doors down the hall. I wouldn’t mind sharing WiFi with someone else if I had a strong signal, but the fact that it was so far away made it pretty much useless. You also list Wood Stove as an amenity. You provided directions on how to use it and offered firewood in the closet down the hall, which was great. However, the firewood closet was locked and no key was provided. When I discussed this with management, I was told that the owner did not provide them with a key for the firewood closet. There are other issues with your unit, but I can live with those things because they weren’t specifically mentioned in your listing. Therefore, I wasn’t expecting something different. The fact is, your listing is severely misleading. Due to this misrepresentation, I believe that I overpaid and should receive a partial refund for my stay. I will be checking out in the morning, but I look forward to hearing back from you. Location is great. This place reminds me of my great grandma's place. It's in dire need of a coat of paint, carpets are crunchy & HORRIBLY stained. I think the extra blankets are about 40 years old. Trim on them is coming off. Pillow are stained... Ewwwwwwwwwwwww! We were only there for 2 nights, so didn't do any cooking . I can't attest to how well stocked the kitchen gear was but for crying out loud, could you please provide more than ONE wine glass? I noticed one picture on the wall where the glass in the frame must have been broken & was replaced with some type of saran wrap or something. The toilet is horribly inefficient & Please....get rid of the decrepit silk flower arrangements!!! We stuck them in the closet. In a nutshell, an OK place to put a roof over your head, but it really needs to be cleaned up & updated. We are extremely sorry for all of the inconvenience in the unit. We will contact the correct people to resolve these problems. We hope for your future stay we can provide everything you need to make your stay more comfortable. Thank you for letting us know. We were pleased. Unit was basic but great proximity to the slopes. Cozy & functional. Internet speed was fine, which was essential for this trip. Jacuzzi was great. I am happy to hear you enjoyed your vacation! Thank you for sharing your experience and we look forward to hosting you again! While the location was fabulous, the complex and condo itself were poorly maintained. Firstly, the condo had not been cleaned before we arrived...the bed had obviously been slept in and half the towels wee already used. Since it was after hours, I went to the store, bought my own cleaning products and cleaned it myself. Also, small things like the out of date silk flower arrangements and the Christmas tree (in July!) made the room seem down and out. Most concerning, was that the propert management on site is not caring for the pool adequately. My husband choose this condo for its proximity to the mountain where his biking event was held, but also for the pool for our children. The pool was cloudy (could not see the bottom), and on the 2nd day, there was some type of brownish foam that spoke of feces or vomit. I called the property management company and while the next day, the foam was gone, the pool was still cloudy and unkempt. A health hazard for sure. Will not be returning. I was very disappointed with this condo! It was dirty and old and it seemed as if the owners put all their old junk that they no longer wanted in their rental. When we arrived, we pulled the sleeper couch out and there were no linens. That was annoying and inconvenient and we had to pick up the sheets the following day from the office. There was no delivery, but management was very apologetic. There were old dingy musty blankets without any sheets. They looked like they were at least 50 years old! Because the pillows had no pillowcases on them, we could see how stained they were and they were disgusting. The bathroom had a cracked wooden toilet seat and we had to make our own toilet seat covers every time we used the bathroom. There were ugly stains on the walls. The sponge in the kitchen wasn't even a fresh sponge. On top of the fridge was a bunch of old silk dusty flowers which only made the condo look dirtier. 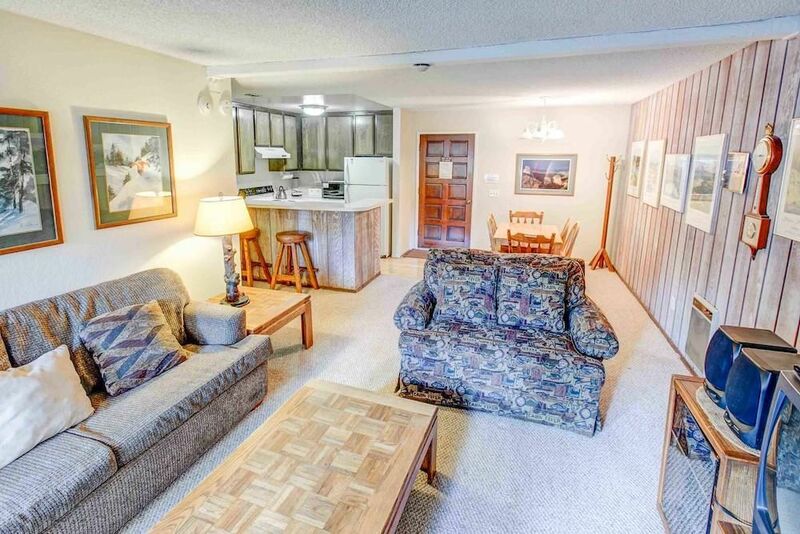 Currently, the only good thing about this condo is its proximity to Canyon Lodge. Despite all my complaints, I feel that if the owners amended these things, the condo could be great and I would recommend it, but definitely not the way it is now.